If you’re travelling with small children, we’ll provide tablets for entertainment and free car seats. For yourself, we provide temperature controls, plenty of space and mastery of the stereo system. What else do you need from your Sofia to Plovdiv taxi service? Why choose us for your transfer from Sofia to Plovdiv? We are happy to offer convenient transfers to the airport or the hotel you need to reach – as well as a taxi from Plovdiv to any part of Sofia. Duration: 1 hour and 40 minutes. Never pay in advance: we don’t request a deposit of any kind. Only pay the price you know: we never add any additional charges to your bill. What you see in your quote is what you pay. Payments: accepted in cash – euros, US dollars, Bulgarian Leva – as well as by Visa or Mastercard, PayPal, bank transfer and PayPal as online payments. From: To: Distance: < 4 pers. < 5 pers. < 8 pers. Our experience with this service was excellent! 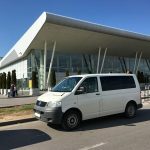 We needed a transfer from Sofia airport to Plovdiv and then back to Sofia airport. Yuri responded with a fair quote within one day. He was very thorough with our flight numbers. Our driver was waiting for us upon arrival, offered to take us to get food before our 90 minute drive, and was very pleasant. Three days later our driver was waiting for us at 4:30am to take us to the airport for a 7am flight. Highly recommended service. Next year when we return to Bulgaria we will use again and also customize a tour. 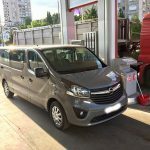 We arranged 3 transfers during our recent trip to Bulgaria - Sofia airport to Plovdiv, Plovdiv to an apartment in Sofia and then back to the airport. In each case our driver was waiting for us on time, the transfers went smoothly and the drivers found our apartments without any problem. The driving was safe and the cars comfortable. Angel was right on time, waiting for me as I walked out of the airport and was a very friendly and informative driver. He kept apologizing for his English skills, even though they were some of the best I came across in Bulgaria. Good, safe driver, would absolutely recommend to anyone. Plovdiv, Bulgaria’s second largest city, hugs both banks of the Maritsa river. This splendid city boasts over three millennia of history, all of which have left their traces on its streets. The city is known to comprise two parts – the New City and the Old City. The Old City immerses you in the atmosphere of times past, with narrow cobblestone streets, old architecture with quaint design features and a huge number of sights which date from different periods. The newer part offers you a multitude of galleries, museums and exhibition halls to explore. There are regular annual international fairs and exhibitions, so you’ll have the chance to experience something a little special at almost any time of year.